10 years ago SYMAAG organised a 3 day/30 mile march from Sheffield to Lindholme Immigration Removal Centre (IRC) near Doncaster to protest against detaining refugees indefinitely. Lindholme has since been closed. Morton Hall is now the nearest IRC to us, hidden in the Lincolnshire countryside. Shortly after our protest at Morton Hall a report of an unannounced HM Prisons Inspectorate visit in November was released. Written before the deaths of two people detained there it identifies a “significant decline in the area of safety since the last inspection”. The Detention Forum’s assessment of the report “it looks and feels like a prison” is here and May Bulman writing in the Independent commented that “the devastating impact of indefinite detention can no longer be denied”. She criticised the Home Office’s “out of sight, out of mind approach” to migrant detention. We hope that our protests at Morton Hall (March 11th was the second – and we’ll be back) let those detained inside know they are not forgotten. And challenge the Home Office’s attempts to hide from the public the stark reality of detention in immigration prisons. Eleven days into 2017 Lukasz Debowski, a 27-year-old Polish man, was found dead at a Morton Hall, a little-known immigration detention centre in rural Lincolnshire. Fellow inmates said that Lukasz was “young and quiet, never causing any trouble”, that he had not committed any crime in the UK and that he had sought medical help for mental health problems. They said he’d spent his time watching TV, playing games and at the gym. They said Lukasz had killed himself, and that he’d been refused bail just before Christmas because he could not provide sureties. His partner, whose advanced pregnancy left her unable to attend the bail hearing, gave birth to the couple’s son on the day that Lukasz died. The mood at Morton Hall was low. Just a few weeks earlier, another Morton Hall detainee had died in hospital. A friend reported to the Detained Voices website that Bai Ahmed Kabia fell down in his cell “foaming at the mouth”, that nurses were called at 3pm, and Kabia was taken to hospital four hours later. Bai Ahmed Kabia was reportedly 49 years old and stateless, probably from Sierra Leone. The friend said he had lived in the UK for 27 years. Detainees had heard that when Bai Ahmed Kabia was close to death, the Home Office had signed his release papers. 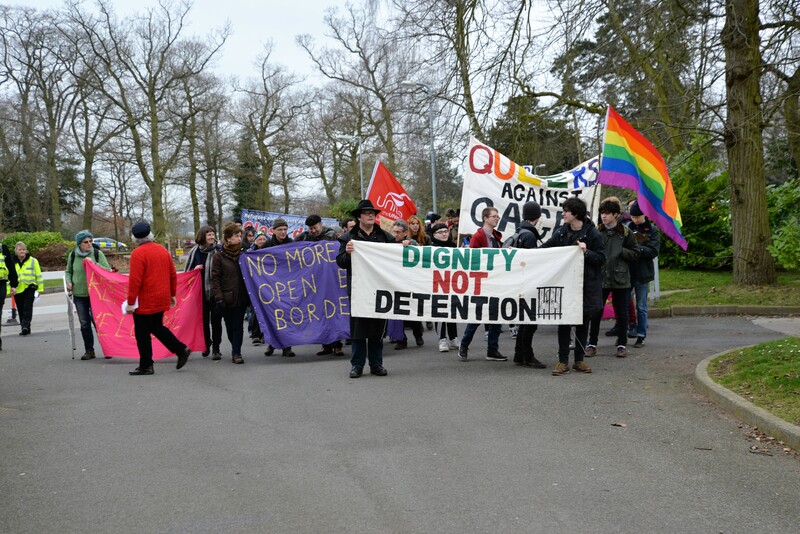 Members of SYMAAG (South Yorkshire Migration and Asylum Action Group) decided to organise a demonstration to highlight the deaths, to show support and solidarity for the 392 men locked up at Morton Hall, and to alert local and national attention to this little-known immigration removal centre in the Lincolnshire countryside. We chose the date, Saturday 11 March. In early February I took a call from Lincolnshire Police Liaison Officer Jimmy Conway 997, a Group B Community Patrol Constable, who is based in Sleaford. He said that he and another liaison officer in pale blue jackets would be the only police presence (with ‘resources’ nearby but out of sight), and asked us to appoint our own security marshalls “to keep everyone safe”. He seemed relaxed. About 60 people travelled from Sheffield, Leeds, Nottingham and Oxford to Morton Hall, near the village of Swinderby, 8 miles south west of Lincoln. Surveillance as deterrence works. Some of my SYMAAG colleagues in Huddersfield and Sheffield had already chosen not to come because they were still in the asylum system. They feared surveillance and its effect on their asylum claims. PC Conway was true to his word. We were greeted at the gates to Morton Hall by a vanload of uniformed police and a van with members of the filming unit. As you can see from the picture: specialist filming cops were getting close-ups of demonstrators. This is pretty unusual in my experience — I have never seen them openly filming amongst demonstrators at the four Yarl’s Wood detention centre demonstrations I have attended. “Twenty two years,” he replied. We had some phone numbers for men locked up inside Morton Hall who had agreed to let us amplify their voices on our sound system. They told us management had tried to undermine the demonstration. “People need medical attention, for mental health, for diabetes. They need physical and emotional support. “They lock us up like prison and it’s bad conditions. They don’t want us to show how we are living here. People taking their lives, we have no release date. You’ve no idea what detention does to your mind and body. Among us protestors on the outside of the fence was Kingsley, who had been locked up at Morton Hall. Our sound system carried his voice to the protestors on the other side of the fence. Morton Hall, a former women’s prison, was ‘reroled’ as an immigration removal centre in May 2011. Within months — in September 2011 — eighteen men went on hunger strike to resist their removal to Afghanistan. In July 2012 two men took to the roof; many detainees were “upset” over the duration of their detention, the BBC reported. The Prison Officers’ Association told ITV News in November 2012 that 150 detainees had protested and staff had “been forced” to use their batons. The POA blamed rising tensions on the mix of high and low-risk detainees. In September 2014 Morton Hall again erupted in a protest after a 26 year old Bangladeshi man called Rubel Ahmed was found hanging in his cell. In March 2015 Morton Hall joined Yarl’s Wood women and people in Harmondsworth in a hunger strike to highlight conditions across detention centres which had been the subject of a parliamentary inquiry, and a Channel 4 documentary exposing conditions in Yarl’s Wood and Harmondsworth. Across detention centres in the UK, figures show that there were 185 recorded incidents of self-harm in 2010. By 2015, that number had more than doubled to 409. In 2015 across the detention estate there were 393 suicide attempts recorded. That’s an average of more than one a day. Morton Hall IRC with 51, was the fourth highest, and had 252 inmates listed as ‘at risk’ of suicide during the year. In a statement to the BBC Look North programme, after the Morton Hall demonstration, the Home Office said it respected “everyone’s right to peaceful protest” but detention centres were “essential elements of an effective immigration system”. Directly after the demonstration Nariman and one of the people who had spoken on the phone to us, Raffael Ebison, were punished and shipped out of Morton Hall. I spoke to both of them whilst writing this article. Nariman told me: “I am in Brook House now, it looks like another prison. They sent both of us here yesterday (Thursday 16 March)”. Postcript: Shortly after this article was written Raffael Ebison, who was moved to Brook House IRC as a punishment for speaking out to protestors at conditions in Morton Hall, was released after pressure. As of 26 March Nariman Jalal Karim, who scaled the prison fence to speak to us, is still detained at Brook House. We ask you to contact Brook House 01293 566 500 to demand his release. Is telling the public how our money is spent inside immigration prisons a crime? This entry was posted in Asylum, Campaigns, Sheffield, State repression by Admin. Bookmark the permalink.